This is a satisfying early English sequence foxtrot composed by Robert T. Almond in 1917. Closed position, backing the Follow along LOD. Part I - Back the Follow (4 bars): Back the Follow SSQQS on first foot (1, 2, 3-and-4), then SSQQS on second foot (5, 6, 7-and-8). Part II - Heel-First Promenade (4 bars): Pivot 90° the left on first foot, Follow backing (1), then chassé three times along LOD with second heel leading (2-and, 3-and, 4-and). Then pivot 180° to the right on second foot, Follow backing (5), and chassé three times along LOD over the hands with first heel leading (6-and, 7-and, 8-and). Part III - Turn and Snap, Turn and Clap (4 bars): Rollaway from partner with three pivot steps (1, 2, 3) along LOD (Lead pivoting to the left, Follow to the right). Then, with rear foot pointed against LOD, raise arms and snap fingers (4). Then repeat opposite, rolling away from partner against LOD (1, 2, 3), clapping own hands on 3, and partners hands on 4. 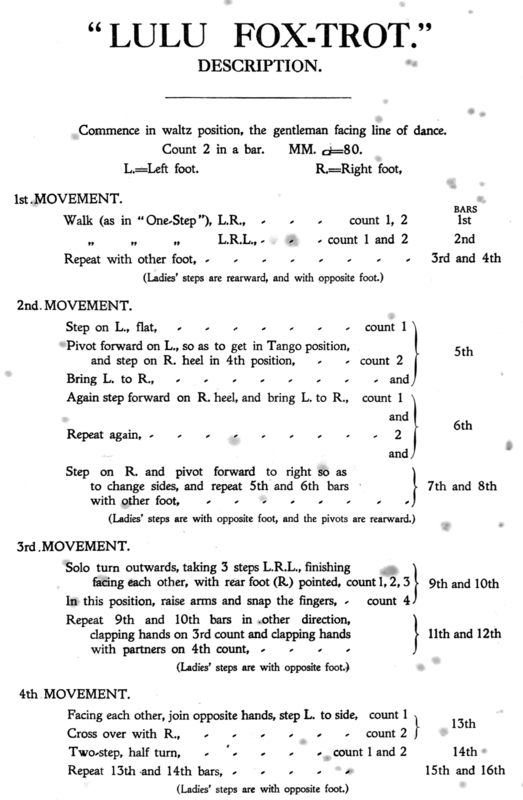 Part IV - Cross-Step Two-Step (4 bars): Taking two hands, promenade two steps along LOD: side (1), cross in front (2). Then two-step halfway around (3-and-4). Repeat opposite, turning 1/4 on the two-step to resume starting position (5, 6, 7-and-8). There's an eponymous tune composed specifically for the dance by Robert T. Almond, but any square, early 20th century foxtrot will work nicely. Tempo is specified as 80 beats per minute. Robert T. Almond. (1917). 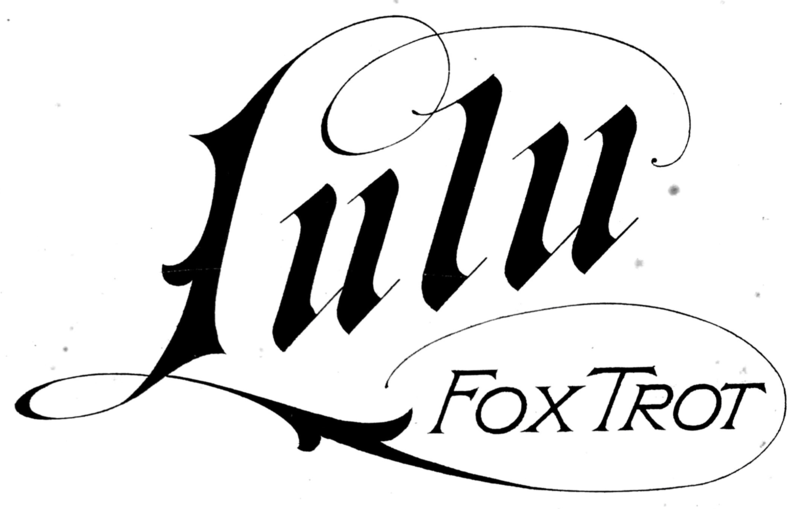 Lulu Fox-Trot, Novelty Dance for the Ballroom. London.